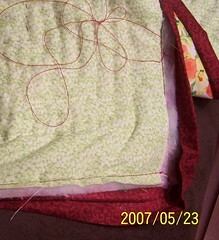 Posted on May 23, 2007	by Linda S.
And then we get to this corner… One would think that I am a comple te sewing novice…duhh.. 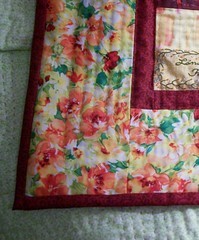 I did not check the back of the quilt after sewing the front of the binding. If I recall correctly, this must be the spot where I had to loosen the pressure of presser foot. (That in itself should have been a red flag!) Anyway, after trying every way I could think of to mask the mistake, it has become very obvious that I will have to remove almost the entire binding and begin again… being more careful this time to monitor the back as well as the front… no matter how many pins I have holding it in place. the corner in the first shot looks might fine, I know it’s a pain to rip out and start again, but I’m sure you can make it right.